Harold Gray's comic strip Little Orphan Annie started Annie's popularity over 75 years ago. The comic originally contained a strongly conservative storyline with Daddy Warbucks even briefly dying during Franklin D. Roosevelt's fourth term only to miraculously come back to life shortly after FDR's death (www.annie75.com). Annie represented how optimism and a moral character could bring someone to the top as Annie took a literal rise from rags to riches. By the time Annie made it to the movies in 1982, however, the conservativism was a bit more ambiguous. Annie and her story seemed to pull Daddy Warbucks and her audience to the political center just as Reagan himself was attempting at the time. This ambiguity can be seen with plot twists such as Annie convincing Warbucks to help in the New Deal, and the removing of the songs about Herbert Hoover that were in the stage production, leaving it less politically extreme in both directions. I'll be focusing on the 1982 movie version, and not the play, because its recorded form is a single production that reached millions of people and because the document of this production is easily accessible in audio and video recordings. Additionally, to most of the people who responded to me about Annie, even for those who saw the play, the movie seems to take precedence in their memory (mostly likely for the first two reasons stated). 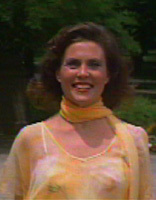 Ambiguity is a part of the success of the movie, and Sherrie Inness sees ambiguity as a key for a female actress's survival (88). If her character avoids gendered labels bouncing between toughness and femininity, she can attract a politically broader audience. While this concept seems to work for adult females, it also works for the younger Annie. At the start of the movie, Annie repeatedly shows her fighting strength, putting up her fists to fight with the threat, "you'll have me to deal with," and defeating an entire gang of boys on her own. Daddy Warbucks, meanwhile, assumes that all orphans are boys, and can't understand Annie because she doesn't fit into his stereotype. "This doesn't look like a boy. Orphans are boys." Is it because he thinks that parents wouldn't give up a cute girl, or is it because he thinks of orphans as being tough ragamuffins for whom he can't conjure up a female counterpart? (Girls in Annie, however, appear to be the only orphans in an orphanage. The only boys shown are in the streets. Actually the only children in the street appear to be boys and an escaped Annie. This traditional separation of female and male space places girls in the domestic/private space and boys in the public space. Boys Orphans are boys." Is it because he thinks that parents wouldn't give up a cute girl, or is it because he thinks of orphans as being tough ragamuffins for whom he can't conjure up a female counterpart? (Girls in Annie, however, appear to be the only orphans in an orphanage. The only boys shown are in the streets. Actually the only children in the street appear to be boys and an escaped Annie. This traditional separation of female and male space places girls in the domestic/private space and boys in the public space. Boys are allowed to roam while girls must be taught to clean, cook, and sew.) Recognized my Warbucks as other than male, Annie is then "dolled" up when she moves to the Warbucks mansion; she is feminized, but she can still fight. Showing Daddy Warbucks a karate move she's learned, Annie kicks Daddy forcing him to hobble to the couch because of the blow. Annie's bouncing between femininity and feistiness persists, however, as she shows her cunning by escaping from her capturers, only to dangle from a bridge crying out one word, over and over again, "help." Annie needs to be rescued by the armed forces (displaying male power), the entire rescue mission having been set in motion by the preeminent father figure, Daddy Warbucks. Daddy Warbucks becomes the family she's always wanted, but he also takes away the freedom and much of the strength she's always had. Inness states that many films depict, "a tough woman only to limit the threat she poses to gender norms by stressing her sexuality and femininity" (89). Annie follows the same trend. Annie's sexuality may be limited because of her age. Still, as her femininity is developed with her haircut, her new clothes, at one point even a bow in her hair, and by then looking further at her pairing with Daddy Warbucks and the role of the other women in the movie, we'll see further evidence as to how sexuality, femininity, and misogyny play out on the screen. Annie is a love story between a little girl with nothing but the courage to dream...and an adult with everything except someone to share it with. She opens him up to human emotions, and he becomes the father she had been looking for her life. Daddy Warbucks and Annie are the pair that must be mediated with views on money and love being the extremes they represent, while Grace, Warbuck's secretary and love interest, contains the sexual energy that a child and an adult are not allowed. In addition to a girl playing the strange role of love interest, she is objectified is another unusual way. Annie and the other orphans don't push the extraoradinarily thin body that confronts girls in pop culture from Barbie to teen magazines. A rail thin body was not stressed, but being small and young was. After all, the biggest orphan is set up as the bully of the group. The auditioning realities behind Annie as a play, with actors replaced as they grew up (Rosenfeld on geocities, 2), placed permanent adolescence as the ultimate goal. In addition to being taught that girls should be young and small forever, a la Peter Pan, audiences learn from Grace the "importance" of sexual attractiveness. Grace removes her glasses, taking her from intellectual to attractive and seer to seen (Doane 83). By letting down her hair Grace takes herself out of the power position in all ways other than sexual, becoming spectacle and not spectator. The adult women's roles also stress the importance of female sexuality over strength. 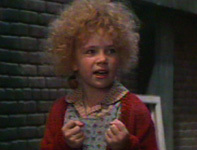 Miss Hannigan runs an orphanage on her own, but she goes weak in the knees at the thought of any man. Her strength also seems to be connected to her meanness implying that powerful women can't be good. Grace presents herself with great authority, but from the start her strength is shown as an outgrowth of Daddy Warbucks. One e-mail respondent pointed this out perfectly while also showing the importance of this character for young girls: "The female who acts as assistant to Warbucks was the first professional woman in my life." While this viewer saw Grace's strength, she doesn't name her and instead identifies her as the female assistant to Warbucks. Additionally, Grace's masculine attire acts merely as a cover for the sexualized woman who only needs a little pushing to come out and move her character from worker to wife. Her sexuality becomes obvious in her flowing hair, suddenly visible slips and underwear. After all, as Annie teaches Grace, "Miss Hannigan says a man don't look at your brains." Lily St. Regis, played by Bernadette Peters, portrays the ditsy blonde, but her strength is shown in her ability to pull off a con job-her connection to evil doings-but her "femininity" is revealed when she immediately returns to whining to Rooster about splitting the money, unable to enforce her own rules. Eleanor Roosevelt, the final female character, is another version of Grace; a woman who stands along side a powerful man. She, unlike Grace, doesn't change her appearance, and as the only female character who maintains her strength, she gains it at the loss of any sort of sexuality. She dresses in masculine attire and her role stresses her position as FDR's partner. This strengthens her because she is given more voice and not put to traditionally feminine tasks. Without the knowledge of history, however, a viewer may believe she is merely a working confidante and not Roosevelt's wife. The movie then confirms that the true power resides in the man when FDR forces her to sing even though she claims not to have a voice. In this strange dialogue FDR tries to give Eleanor voice, a voice she denies, yet his desire to have her sing is forced upon her and not her own choice. 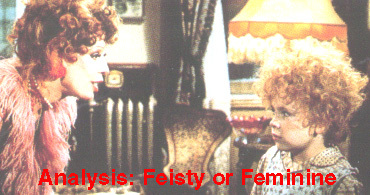 Miss Hannigan may teeter between strength and sexuality, but as a woman without a man, the movie claims she cannot feel complete. Additionally, because she doesn't have a man to rule over her she is seen as the source of evil in the movie and the brunt of much of the movie's misogyny. 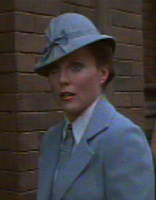 When she first appears in the film, she is preceded by her shadow, a look of fear on Annie's face, and a change in music to that of a horror film. As she comes into the light, she of course holds a bottle of alcohol to avoid the reality of her life. Worse, however, than her portrayal is that the character is a source of misogyny toward others. Her first line is, "did I hear singing in here?". Later when she again walks in on the girls singing, she says, "Do I hear happiness in here?" She stops the hope and happiness of the girls. She calls them names such as "my little pig droppings," so that her word choice makes them sound like garbage. (Likewise the girls make fun of her with their imitations and physically harm her by repeatedly stepping on her feet). The ultimate song of females pitted against each other is Miss Hannigan's song "Little Girls" that includes such lines as, "some day I'll step on their freckles some day I'll straighten their curls." With Miss Hannigan opposing the orphans, their animosity seems to be caused with each blaming the other for their feels of absent love. While Miss Hannigan is a major proponent of the misogyny of the tale, she is also a version of the star showing all woman in this role of submission to the powerful males. 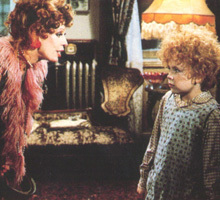 Miss Hannigan appears to be a possible grown-up version of Annie with her reddish curly hair, just as Miss Hannigan herself implies to Grace when she says that Annie's a drunk, and when she wants Daddy Warbucks to "trade up" to her, and further attempts to convince Warbucks that she's the one for him with her explicitedly sexualized "Sign." Another possible version of Annie exists in a younger self, Molly. The script labels Molly as a "reflection" of Annie (Sobieski 6a). Interestingly, Molly plays the role of Miss Hannigan when the girls "play" their lives-furthering the circle-Molly to Annie to Miss Hannigan with an additional possibility in Sandy the dog. Sandy receives Annie's attention because he needs someone to care for him, just like she wants. She takes on the role of Sandy's mother and refuses to leave him even when it may mean she loses the chance to go to Daddy Warbucks. She won't make Sandy an orphan. She then uses Sandy as a way to express that she's scared to sleep alone. "Sandy's not used to sleeping in a room all by himself. He gets lonesome," she says, projecting on him her own fears. 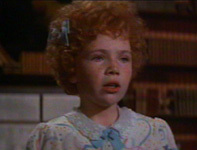 Annie, is then treated like a dog shortly after she appears at Warbucks's house. Does Drake sneeze because of the filth on Sandy or on Annie? Doesn't Grace's knee-slapping call of "Annie," seem very much like the calling of a dog? The role of Sandy seems to teach that people need to own each other, as the dog-catcher asks Annie, "where's his license? Where's his leash? He's no more your dog than I am your father." Sandy needs a license and a collar, he tells her, and then Sandy is hers. Although Annie never collars Sandy, everyone is looking to collar Annie. Rooster and Lily try to get Annie with a birth certificate (the license of her birth) and proof of ownership through her old broken locket (her collar), but Daddy Warbucks wins the quest for ownership with his adoption license and his ability to finally place a new locket on her neck which is engraved with her name and her owner's name, Daddy Warbucks. Annie needs to escape Miss Hannigan, her evil step-mother, and get saved by "Daddy" Warbucks who is further paternalized by his assumed name. Susan Jeffords sees this trend as part of the Reagan Era's "Remasulinization of American Culture" (Traube 18) in which one could criticize affirmative action by saying that "the idea of rising by any means other than individual effort is a feminine mode of success, which is practiced, accordingly, by women and minorities but repudiated by real men" (18). Annie receives charity from Warbucks through a kind of lottery, but Warbucks stressed that he worked for his money. Annie needs a Daddy Warbucks to help her rise because she is an orphan, but specifically an orphan girl.